Nixon (Bill Christ) in a final damning close up while being interviewed by David Frost (David Townsend), playing through May 10th at Portland Center Stage. 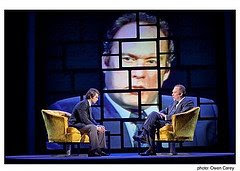 Frost/Nixon at Portland Center Stage: An outstanding show. Bill Christ's portrayal of Nixon was unique and yet so very Nixon: the broad hunched shoulders, the deep voice, the smile quick as a 70's flash cube. His one-liners surprised me, bringing hearty laughter. Evidently I wasn't the only one ever surprised by Nixon's sense of humor. I loved the costuming and the set. All that corduroy, and I could've sworn the sandwiches were Wonder Bread. But most of all I loved the risk-taking and impossibility pulling me inch by inch toward the stage - even when I knew the ending. The performance suggested to me that Nixon, despite his failures, was an intimidating figure, a strategic speaker, a polished politician. Bill Christ reflected an enormous sense of presence and charisma. David Frost, wonderfully played by David Townsend, was seen by the world as a two-bit entertainer going down the tubes fast. Frost's interview was a long shot and financial backers pulled out. "Success," says Frost. "A sickening thought when it's left you . . . it will never come back." The interview was scheduled nevertheless. Each consecutive day of taping had Frost hunkering down in his seat while Nixon took the limelight. Frost's team of professionals visibly drooped. All the thinkers, lawyers, and strategists in Washington and around the world had been unable to pry any kind of confession from Nixon, and this interview, too, would be a failure. In the end I think it was Frost's humanness, his instincts and sense of timing, and the fact that he listened through all the taping of those first hours that brought about one of the most compelling moments ever seen on television. It was a tale of heart versus brains, enthusiasm over critical thinking, hope over fact, perhaps even charm over substance. A long shot indeed. Don't we feel just as hopeless when the dream of a story or a project winks into flame in our hearts? It looms like an impossibility. Folks are going to laugh at us: we just know it. Everyone else is smarter, better qualified, cooler, more capable. We're just lightweights, small potatoes. In the same way, the critical part of our brain, (sometimes designated the left hemisphere), seems like the best way to solve problems. It has broad shoulders and enormous confidence. It has debate skills and the power of thinking. The childlike, "trivial", playful part of ourselves (sometimes designated the right brain) is easy to look down upon. What value is there in entertaining? Writing stories? Making art? Being nice? Pfaw. But the truth resonates with all of us. It's the dreamer, the lightweight, the kid with heart and the too-big armour who finally slays the giant. What dream have you given up because you felt out of your league? What an excellent post, Christi! You've got me wanting to watch that interview again. Great post! Nicely written. Perfect point.